Earth & Soul is our 300 acre (112 hectare) property located at Cannon Creek, 12 kilometres west of Stanthorpe on the Granite Belt of Southern Queensland. When you enter our property, just inside the gate you turn right into an open field - this is the World of the 22nd Path – the Tree of Life Spiritual Walk. The walk consists of 11 connected paths that lead out from the Source and travel to Earth. Then you return to the Source along the same 11 paths. The total length of the Tree of Life Spiritual Walk – outward and inward combined – is approximately 1400 metres (1.4 kilometres). Time-wise, you can walk up and back in around 20 minutes. Nestled within a tree-lined perimeter the Tree of Life Spiritual Walk seems secluded from the everyday world. Occasionally there is a glimpse of hills and trees outside of this perimeter but mostly you are contained within the world of the 22nd Path. 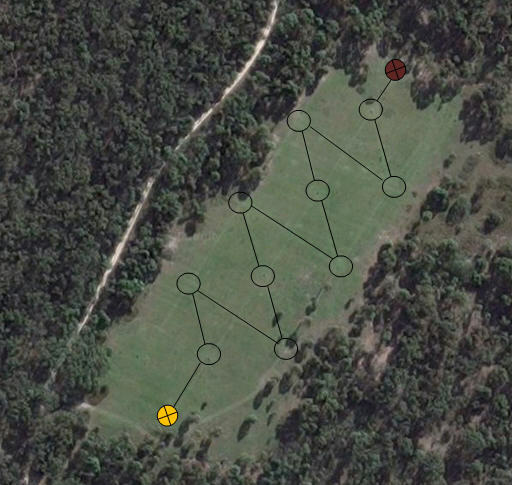 In laying out the walk I have done very little to interfere with the natural setting. A granite rock and a timber sign have been set at each node and along each path. The paths are not formed. They are mowed so you are not walking in long grass. The ground is reasonably level but there are the natural undulations and unevenness of the ground. The Tree of Life presents a model of the creation of the universe and the pattern of the rhythm of life. It is drawn from the teachings of the Kabbalah’s Sepher Yetzirah (the Book of Formation). In the diagram to the right, you can see that the paths emanate from the Source and connect from circle to circle. The circles are called Sephira (singular) and Sephiroth (plural). Essentially they are states of being. Sephira/Sephiroth is a Hebrew word that comes from the root for the word Sapphire and this is fitting as each Sephira is a shining, shard of light splintered off from the main Source. 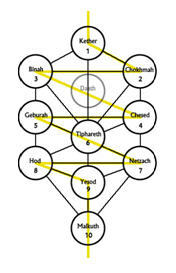 Although the Kabbalah of the Jewish belief system is the main source of reference, the Tree of Life Spiritual Walk does not represent any particular religion or religious practice. My interpretation of the philosophy is intended to be entirely non-religious and non-denominational. I prefer to refer to entities and higher authorities as energy and rather than the word God I prefer the word Source. The Tree of Life Spiritual Walk is the manifest, living model of this spiritual philosophy. It is intended as a spiritual experience and a reference model for spiritual development. Together with information drawn from the Tarot, this is a complete spiritual philosophy and provides a positive model for living a good and balanced life. The Tree of Life is a practical model for contemplation, meditation, learning and understanding of life. By taking this model from books and dreams and manifesting it on the ground as a real structure that you can walk and see, then it becomes a powerful, active, physical learning aid. The Tree of Life Spiritual Walk holds different things for different people. Every morning I walk the Tree of Life Spiritual Walk before heading to work for the day. From the Source I walk down the paths to the place of the Earth. At Earth I have placed a timber bench seat to sit upon and, for however long I have available, I sit and ponder, write, think of the Tree structure, until my time is up and I have to head off to the world of work. Depending on how I feel I either return back along the same paths that I came down or I ascend straight up one of the pillars. The central pillar represents the physical world; the left hand pillar (from this earthly perspective) is caring, feeling, emotions and form; and the right hand pillar is thinking, reason, mental processes and force. Sitting on the bench seat at the base of earth you look directly up the line of the middle pillar – the physical spine – of equilibrium. Whatever it may be that works for me, my preparation for the day ahead is more settled; I feel more at peace and prepared to sacrifice my personal life for the next 8 hours. Previously in my working life I had experienced a severe case of burn-out and Post Traumatic Stress Disorder (PTSD). After 18 years as a Police Officer I found myself outside of that profession and on a pension for the rest of my days. I was 37 at the time. I wandered in the wilderness for a short time, then went to university and satisfied myself with a degree in IT (data base systems). Five years later I found myself back in full employment. 18 years later I find myself revisiting my old friends burn-out and PTSD. Again I ask myself “What’s going on?” This is when I started working on my Tree of Life Spiritual Walk project. With another project that I am working on to create a labyrinth and performance space, these on-going works in progress have brought me peace and tranquillity, solace and sanctuary from a world that I am not suited to. But regrettably I do have to work for a living. Like most people, my hobbies and projects – the things that bring me peace and tranquillity – do not fund my life. I just cannot opt out of that everyday working world. I have realised though that burn-out is trying to tell me something. I am not suited to the world that I work in. I have to change my life or it is going to keep happening. The whole process of the Tree of Life Spiritual Walk – researching it, building it, walking it, writing about it – has proven to be good for my soul. I have been writing and thinking about Tarot, Numerology and Kabbalah now for a long time and I know when I do these things that it is good for my soul. I also write songs, I sing and play guitar and I know this also is good for my soul. The thing that stands out for me is the transformation that has occurred in changing from thinking about it, writing about it, talking about it and actually physically manifesting it. By creating the practical thing on the ground, like magic in my life, it has brought it to life. I am actually doing it. The physical change has manifested physical, emotional, mental and spiritual change. I was asked a question of how I thought the changes had affected the site. What has this transformation done for the environment? In addition to the impact on me and others, the Tree of Life has changed it from just being the Top Paddock as we called it; a place that we didn’t visit often but only occasionally and then we were just passing through; to a place that is visited daily and loved and appreciated for the views and the spiritual quality it now is acknowledged to possess. What I have become aware of, with the Tree of Life Spiritual Walk, is how much more effective than any of the other human functions is the quality of doing. When you manifest something and bring it into action then there is a dynamic shift on each of the other planes – emotional, mental and spiritual. This shift is much stronger on the active physical plane. For 30 to 40 years I have been reading, studying, researching, thinking Tarot, Numerology and Kabbalah. The philosophy has a strong influence upon my life but it would seem it is not anywhere near as dynamic as actually physically investing the earth with the energy of the Tree of Life Spiritual Walk. Now I cannot say what the Tree of Life Spiritual walk holds for anyone else. Everything about it seems to be a personal thing. The quality of being personal flows through my entire philosophy. The Tree of Life design that I have created is my own design. It does not follow the traditional Kabbalist’s Tree of Life. My design is balanced and functional and is conducive to a balanced and functional life. For some people walking the Tree of Life Spiritual Walk is nothing more than a casual walk in a green field, in the open air, looking at and interacting with the scenery of nature. It is 20 minutes of peace. It is time out. Step out of the world and take the time to think of nothingness. This is a good starting point as Nothingness is where the walk starts and ends. I refer to this starting point as the Source. In Hebrew it is called the Ain Soph Aur which means the Absolute Limitless Light and is also referred to as Nothingness. The walk follows the pattern of a Lightning Flash, zig-zagging from left to right and back again until eventually grounding in the sphere of Earth and then returning to the Source. The Hebrew refers to this Lightning Flash as the act of Zimzum and relates it to the creation of life in the void. From the Source walk the paths outward to the place known as Malkuth (Kingdom). This is the access point or gateway to the physical life of earth. From Malkuth step onto the path of the Wheel of Life and spend a little time in Earth. Earth is where life takes place as your soul undergoes experiences, learning and development. Earth is split into 4 quadrants. Following the model of the 4 worlds, they are Intuition, Mind, Feeling and Action - also Fire, Air, Water and Earth respectively. Once you have grounded in the sphere of Earth contemplating the four human functions and how they play out in your life, then when the time is right, you step back from the Wheel of Life to Malkuth (Kingdom) and commence the walk back to the Source, travelling back along the same series of paths. This time the paths take you on an inward journey. The outward walk from the Source represents the development of the ego and the involution of the soul into the physical body. The return, inward, walk represents the soul searching inwardly for answers and the development of the conscious self and personal awareness and re-connecting with the Source. These two things – the ego and the conscious self – must seek and find, then maintain, a balance in the world. The walk progresses through four worlds – emanation (spirit), creation (mind), formation (emotion) and manifestation (physical action). Outwardly this is a progression from spirit to the dense world of matter. Inwardly this is a return from the physical world of matter to the world of spirit, back through the four worlds - this time in reverse order - from manifestation (physical action) to formation (emotion), to creation (mind) and emanation (spirit). Also as we walk through the four worlds, the paths take us progressively through the 10 Sephiroth. Again, outwardly and inwardly, we encounter the same 10 Sephiroth. Our focus and perception on the outward journey is ego-driven and physical. The return inward journey sees a shift of our focus and perception towards being spirit-driven and enlightened. Another aspect that you encounter as you walk the Tree is the three Pillars – the Middle Pillar of Equilibrium, the left Pillar of Force and the right Pillar of Form. These terms and their influence will be explained further later on. The physical body is like a cloak, a sheath of electrical energy that restricts the ability of the soul to communicate with the energy of the Source. The outward journey sees the entity gradually and most effectively cut off from the Source. The return journey sees the entity gradually reconnecting with the energy and communication of the Source, despite the complexity of the physical body. Think about this as you walk - consider getting back in touch with your feelings; get back in touch with your thoughts; get back in touch with your Spirit; get back in touch with your Source - speak, hear and listen. The Tree of Life represents life and events at many levels. The journey of the soul is a parallel to our own specific journey and our experiences – outwardly and inwardly we walk the same paths. In life we continually walk the same pattern, repeating through experience after experience, day after day, year after year. The pattern of the Tree of Life repeats endlessly. Similarly the soul grows through repetitions of the cycles of life known as reincarnation. Many people are in search of something - seeking answers to life and how and why the world works the way it does. Why do certain things happen to certain people? There are several reasons for studying the Tree of Life – understanding God, understanding the Universe, understanding humanity and just plain understanding you. The questions are endless and the answers can seem unfathomable. Personally I find my Tree of Life model and the philosophy goes a long way to providing these answers. What is the Sephiroth that I am at? Am I travelling outward or inward? What are the outward paths into and out of this Sephira? What are the inward paths into and out of this Sephira? What is the Pillar that I am on? What is the World that I am in? What is the balancing energy of this Sephira? What is the path that I am on? Which Sephiroth is this path coming from and going to? Am I on an outward path or an inward path? What is the reciprocal path? What Pillar am I travelling from and to? What is the complementary path to the path that I am on? What is the reflexive path to the path that I am on? What is my ruling path in life? With reference to this ruling Life Path where am I coming from and going to in terms of Paths, Sephiroth, Pillars and Worlds? Where am I in the greater scheme of things? What are my personal year, month & day numbers? Keeping the Tree in context according to your life can be complicated and heady work. Learning and understanding the cycles takes time. It is important at all times to extract from the moment the most positive and relevant experience. The Tree of Life is about living life positively and in balance.